1. Retail Sales: -0.3% vs. -0.1% est. 2. Industrial Production: 1.0% vs. 0.4% est. 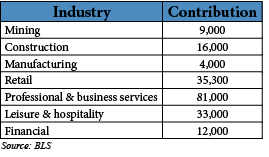 After declining in August, industrial production blew past estimates in September.Within the main industry groups, all three were up on the month as shown below. Utilities jumped largely in part to a warmer-than-average September which kept A/C’s running while manufacturing got back to its upward trend. On a capacity side, overall utilization rose by six-tenths to 79.3 which stands around a full percentage point below the 40 year average. Manufacturing is 1.4% off from it’s average so there is still plenty of room to go. 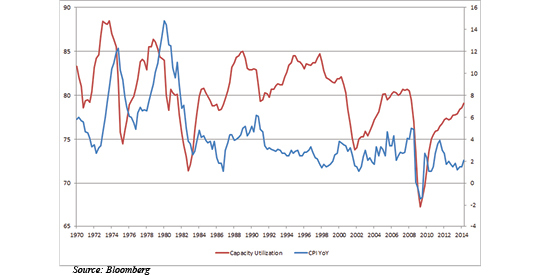 Much has been said about the relationship between capacity utilization and inflation. At times, there is a higher correlation and pairing between the two and at other times, not as much. Recently, inflation remains muted while utilization is steadily increasing (Figure 2). 3. Housing Starts: 1017K vs. 1008K est. Housing starts are a choppy a number and while the absolute level gives you some indication of activity, a simple permit or beginning of a build means little. The sales numbers which follow are where attention should rest. For the time being, we’ll say housing continues to move forward and progress past speed bumps. The technical gurus, perma-bears, and others can all finally be satisfied the market “corrected.” Futures reached a high of 2014.3 on September 19th and a low of 1813.5 on Wednesday (SPZ4 – Dec 14 contract) to barely squeak out a 10% down move. Volatility rose sharply to follow the move with the CBOE VIX Index cresting above 30 for the first time since the mess we saw in the fall of 2011. The S&P 500 on a OHLC view made a nearly 100 handle move on Wednesday with the intraday low reaching in the -3% range. Crude oil continues to get slammed with the WTI front month briefly trading a shade below $80. Most analysis pegs profitability for certain types of drilling at $80-85/barrel. We could start to see production coming offline as the oil industry deals with oversupply due in part to the two-headed beast of slowing China demand and improved domestic production (e.g. North Dakota’s shale boom). Treasuries also experienced a wild-ride with the 10 Year falling under a 2% yield. Wednesday was one of those days you put your horse blinders on if you are a long-term investor. These things happen, it is best not to get caught up in the countdown, graphics, talking heads, and other nonsense continually thrown at you from the media. You can read the recent posts from John Eckstein and Rob Stein to get more thought from Astor’s Investment Committee. As we move into the week before Halloween, the data is light and mostly focused on housing. Existing and new home sales will be the more important releases for the week with a check-in on CPI likely giving further confirmation of inflation running below the Fed target of 2%. Data points like these will be put on the back burner in the near term as attention is directed toward Europe, China, ISIS, Ebola, the Fed, etc. Unless there is a major surprise, do not expect an update on housing to provide ammo for any extended market move. Will last week prove to be the bottom of the sell-off? Time will tell, but the charts in certain areas of the market look favorable. Small caps are leading the charge from the lows (at the time of writing, nearly a 6% rise from the lows on 10/15). The one concern for me is we get too hot too quick. I would like to see a test of lower levels again before setting up for the next leg higher. I say this statement mostly because I know there are a good number of people who think we are still expensive and want to see period of lower prices. Appeasing the crowd now will lead to a better tomorrow. Existing Home Sales: 5.05M vs. 5.20M est. New Home Sales: 504K vs. 430K est. A mixed basket of data last week for housing on a base level. 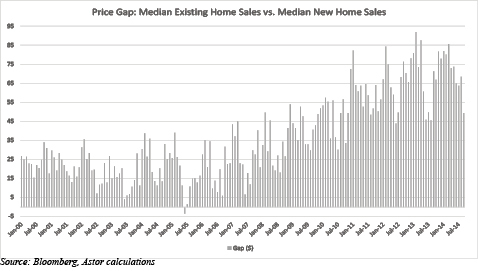 However, even with the miss from existing home sales, there was a silver lining. The number of all-cash deals fell to 23% and the number of purchases from investors fell to 12%. Homeowners now have a better chance of maneuvering in the market and could find themselves with accepted offers instead of being bulled over by the deep pockets of cash investors. The housing market is starting to get back in balance. It could use help from the labor market (higher wages) and mortgage lenders (easing of standards). The rental market will only cool off when home ownership becomes affordable and viable again for the young professionals in their twenties who still live in mom and dad’s basement. 2. Durable Goods: -18.2% vs. -18.0% est. On a headline view, this report looks downright abysmal but then you remember last month was +22.5%. The entire drop was simply transportation coming back to earth after the massive surge in airplane orders (Boeing) in the previous month. Ex transportation, we actually had a really good showing. August was up 0.7% and July was revised higher by 0.3%. Orders and shipments in the “core” group (ex defense, ex air) were both positive and point toward further strength down the line. Unfilled orders and inventories both stand at historic highs for the data series. 3. Q2 GDP: 4.6% vs. 4.6% est. On an absolute level, volatility (as measured by the CBOE VIX) is still low in comparison to its historical mean. However, last week we had a 20%+ spike in the index as stocks went on a roller coaster ride. The slope was down all week, even with a mid and end of week bounce. Thursday brought out the sellers in heavy fashion and red was the color of the day. It did not matter what size stock you were, on Thursday it was down, down, down. The S&P 500 and Russell 2000 both ended the day down over 1.5%. The Dow had the largest point drop since July 31st. Most of the downdraft was focused on global growth concerns. The U.S. economy is the shining star right now and thus, the dollar has been heavily bid. Commodities have suffered as a result with crude oil treading water above two-year lows. The deluge of data begins. 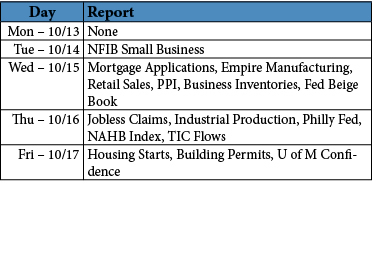 With month end numbers and NFP Friday in the mix, I will be busy all week reading econ reports. Expect a lot from me in next week’s post. 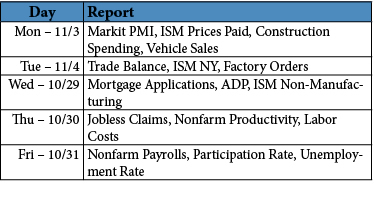 If I were to pick out two numbers I am focusing on this week, they would be employment within the ISM Manufacturing number and hourly earnings in the employment numbers on Friday. I personally think the United States is working towards a second industrial revolution and will pull workers from overseas back to the mainland. The competition in wages is starting to slim down and technological advances here (think 3D printing) are starting to give us a second wind. Wage growth, as I have said many times before, is important in respect to labor slack. It looks like the last few days of September are setting the tone for October, generally a month which invokes fears of a crash (you can thank 1987 for that one). Large cap stocks continue to widen the gap between their small cap counterparts. The rally in equities this year has been dominated by large companies. As of Friday, the spread was slightly over 11% with the Russell 2000 negative by nearly 3% for the year. Looking at the table below, you can see the divergence in market breadth. We are strong believers of mean reversion here at Astor. I am sure there is a group of traders out there who see an opportunity to place a spread trade in order to capture the reversion (i.e. Buy Russell, Sell S&P). Then again, there is always risk of a further widening. We have spent the last few years drinking from the Fed Fountain and it has been sweet. Soon we will have to scout for other sources of liquidity (no pun intended). 1. Industrial Production: -0.1% vs. 0.3% est. 2. CPI: -0.2% vs. 0.0% est. A sharp drop in energy prices helped caused the first decline in MoM CPI since April 2013. Gasoline fell 4.1% in August. Core prices (excluding food and energy) were unchanged for the first time since 2010. However, there are signs of inflation slowing moving into the system. As the months move along, the rolling six month CPI on an annualized basis is staying near or above 2% which is the Fed’s target. Expect to see inflation coming through owners’ equivalent rent as the rental market will likely stay hot in the coming quarters. 3. Housing Starts: 956K vs. 1037K est. Once again we have a disappointing number caused by a prior month spike. Housing starts are always a volatile number and this time around was no different. A 22.9% increase led to a 14.4% decrease. It happens. The trend is still moving in the right direction. The 3/6/12 month moving averages for the numbers of housing units started are look good. While we are no where near the 2000s peak in 2005, we are slowly moving back towards those levels. As always, I am keeping an eye on this data point as well as other housing numbers to see if spring strength stays intact while rates remain subdued. Coming into the week at month lows, the S&P bounced hard off support in the 1980 range to surge to new record highs. Weak economic data (i.e. industrial production) kept the market muted on Monday but comments from the FOMC in the middle of the week gave reason to buy. The Fed re-iterated it would keep rates low for a “considerable amount of time” which was well received. Disappointing housing numbers on Thursday gave more support for rates to stay low and therefore, asset prices to remain elevated. While the broad market held fairly steady on Monday, growth names took a hit. Tesla (TSLA) took a plunge after a note from Morgan Stanley which led to selling across similar high flying stocks. The coming week is split between two important segments of the economy: housing and production. If the housing numbers are in line with last week’s releases, there could be chatter about the market slipping. Unless there is a substantial drop in demand, we should see any amount of weakness as simply a market still trying to figure itself out. On the production front, durable goods for August will be hitting the wires on Thursday. The key number will be the nondef ex air report since transportation caused a huge spike last month. Headline estimates are for a -18% drop as orders normalize. 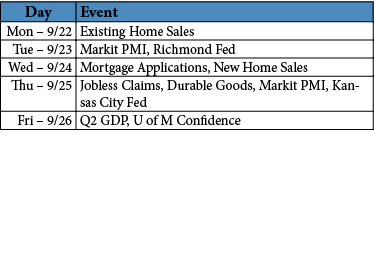 Another look at Q2 GDP will round out the week and should cause little market movement. The forecast is for an upward revision. After a strong week in equities and a divergence between small/large caps widening out on Friday, the picture for this week is probably mixed performance and further focus on the high beta names (story of the year so far). 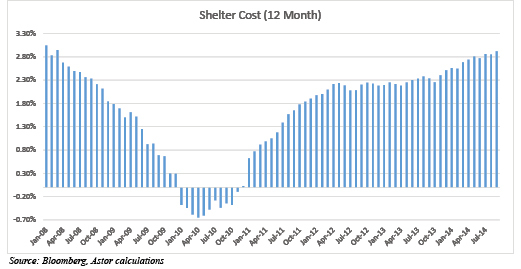 As QE3 purchases reach the end of the line, look out for rate reaction moves in the coming weeks. A little late in posting today, Monday’s can be hectic. Let’s jump right in and have some fun. 1. Retail Sales: 0.6% vs. 0.6% est. Hello there shopper! We thought you went away. You were just hiding behind revisions it seems. A great August report coupled with an upward revision for July should close the door firmly on the question of spending tailing off. A drop in gas prices (shown best by the -0.8% decline in MoM sales) likely provided fatter wallets to be used at furniture and appliance stores, both of which saw 0.7% increases. Mild weather also probably added to the picture. Usually we all spend August indoors with AC/DC on blast…I mean the A/C. All-in-all, this report leaves me…bum bum bum THUNDERSTRUCK. 2. Consumer Credit: $26B vs. $17.35B est. Much of the buildup in consumer credit lately has been from the auto sector and student loans. Both areas have at least triggered attention but most likely remain under high alert levels. It all comes down to affordability. As long as consumers are buying within their means, we are on the right track. The default rate has ticked up lately but is still far off from recession highs. Just another data point to keep an eye on. A healthy job market and rising asset prices will likely prevent a larger issue so until the environment flips upside down, there is no need to hit the big red panic button. Stocks took a breather last week after hovering around 2,000 for a few days. 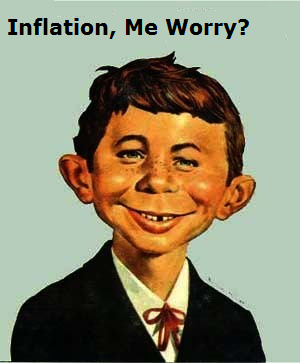 A bit of worry has crept into the market in regards to the expected rate hike coming in 2015. Anyone else feel like we are waiting for a blockbuster movie? Depending on which side you are on, the tag line is either: “A chilling tale of tightening monetary policy coming to markets in the spring of 2015, The Ratepocalypse!” or “A forbidden relationship between a financial instrument and a recovering economy coming to markets in late-2015, “A Slow Rising Affair.” I digress. It is Monday…sometimes you just need to make yourself laugh a bit. There were actually a multitude of catalysts last week which both gave reason to sell and reason to buy, including Apple’s new devices, further sanctions against Russia, some M&A activity in the food space, excitement about Ali Baba’s IPO, and strong consumer reports. A 1% dip over the course of a week is a shoulder shrug, especially coming off year and decade highs. I’m sure CNBC has a sell-off special report queued up already but ignore the talking heads. Much of the focus for the week will be on the Fed as QE3 winds down to the last little bit and more guidance (hopefully) is given in regards to rates. Some housing numbers (starts, permits, etc) will show where the state of the market is as we leave the summer season and head into fall. Industrial production already came out and along with capacity utilization, was disappointing. These numbers will be covered next week. The minor setback in equity prices could see continuation this week based on technical indicators, the Fed, economic numbers, and a whole host of other variables. On the flip side, we could bounce off these levels and provide solid support for the move into the end of the year. Most price targets remain north of 2,000 for the S&P 500 with some near the 2,050 to 2,100 levels. Personally, I think we end comfortably on a 2,000 handle to bring in low double digit returns (assuming dividends re-invested) for 2014.